The day the NCAA brackets were announced, I wrote this post on the nature of structural inequality. I argued that even though we like underdogs and upsets, the odds favored the turnout we expected from the beginning. As it turned out, three of the final four teams had been designated #1 seeds before the tournament (Go State!). This is probably as it should be — the best teams (at least as determined by the seeding committee) get to play in the Big Game. Wisconsin has been in three final fours and won the whole thing in 1941. 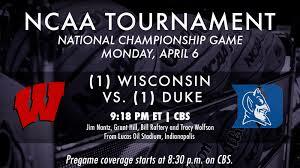 Duke has been in fifteen final fours and has four championships, the most recent in 2010. This echoes one on the basic ideas in stratification: past benefits accrue over time. This weekend I finished the two books I’ve been reading on the nature of inequality in America. As I’ve written, one is Our Kids by Robert Putnam and the other is The Long Shadow by a team of sociologists from Johns Hopkins. Reading them in tandem was enlightening. Putnam’s book is full of site-specific case studies contrasting successful kids and challenged kids. Whether in Ohio, Oregon, Atlanta, or Orange County, similar patterns emerge. Each chapter fleshes out the case studies with national census-type data. The Hopkins book also uses a site-specific comparison with some incredible data following the same set of kids from 6 to 28. The authors look at neighborhood characteristics, family dynamics, school conditions, and economic concerns. Where Putnam relies on story, the Hopkins folks end up doing some high level regression to look at how status is transferred (or not) across generations. One of the curious things about the books is that they don’t work with the normal journalistic 1%-99% comparisons. Half of Putnam’s families are upper-middle class but nobody has a yacht. The Hopkins book focuses on families in the Baltimore Public Schools, so they don’t pick up those who moved to more affluent suburbs. This is important. The inequality characterized in the books is not the story of rich people. It’s about “normal” people and those who have somehow been left behind (usually through no fault of their own). Both books wind up telling exactly the same story. There is a significant difference in access to the very things that contribute to intergenerational success. Those who have resources use those to achieve. Those who don’t find themselves falling further behind. Here’s a chart from The Long Shadow (page 124, picture from my Iphone). My stats students will recognize this as a Chi Square table. The rows represent the social class of origin. The columns represent the social class at age 28. The expected values tell us what we’d expect to find if there was no relationship (as one would expect in a meritocracy). 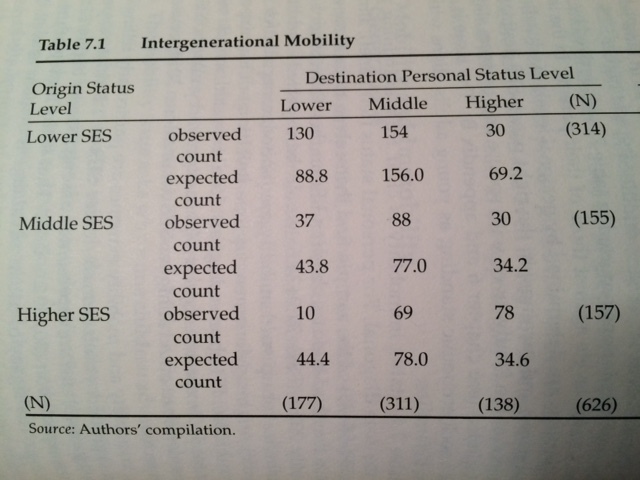 As the table shows, those who start out lower SES half are still lower class at about 1.5 times expected. They are less than half as likely to be upper SES at 28 as expected. At the other end, the upper SES kids who were lower class was only 1/4 of what would be expected but more than twice as likely to be upper SES at 28. Because of growing class segregation in America, fewer and fewer successful people (and even fewer of our children) have much idea how the other half lives. So we are less empathetic than we should be to the plight of less privileged kids. Before I began this research, I was like that. I’ve worked hard, I thought, to rise from a modest background in Port Clinton— much of the time heedless of how much my good fortune depended on family and community and public institutions in that more communitarian and egalitarian age. If I and my classmates could climb the ladder, I assumed, so could kids from modest backgrounds today. Having finished this research, I know better. What factors explain these differences? Both books illustrate the patterns of family life beginning prior to the beginning of school. Those who have advantages are able to start strong and have school work for them. Those who don’t begin behind and have family or community disruptions that inhibit the expected school to college to occupation pipeline. There are differences in school quality and neighborhood safety. But these pale in comparison to family struggles. It is unreasonable to simply suggest that the disadvantaged should care more about school or have better marriages or take their kids to church. It’s not all economic but it is largely structural. Moving forward in the ways we seem to expect as a society may seem self-evident, but we have to address that fact that some people are starting significantly behind. This is why Putnam’s book ends with some specific recommendations that our policy makers should act upon. Enhanced Earned Income Tax Credits, better child care supports, teacher incentives to poor schools, changes in sentencing and reentry policies. These will all cost money in a time when we seem unwilling to do so. But we will pay much higher costs downstream. If we can grasp Putnam’s understanding that these are in fact Our Kids we might see that such investments are not only feasible but mandatory in modern society. Thank you, John. I’m reading Lani Guinier’s book, The Tyranny of the Meritocracy, which engages the concerns you detail here, in relation to higher education. We have a lot of work to do. « Will RFRA laws “lead towards anarchy”?